Evan is a native of Spartanburg, South Carolina. He grew up on the Eastside of Spartanburg, attended church at First Baptist Spartanburg, and went to school at Spartanburg High School where he played varsity football. He is the son of Major General Glenn and Faith Bramhall. Evan received his Bachelor of Arts from Clemson University where he majored in History and minored in Italian. During his collegiate years, he volunteered as a football coach for junior high and high school teams. Evan attended law school at the Charleston School of Law. During law school, Evan clerked during the summers at the 7th Circuit Solicitor’s Office. He was admitted to the South Carolina Bar in 2013. He began his legal career that year with a law firm in Greenville, SC. Evan joined Duggan & Hughes, LLC in 2015. His practice covers Family Law, Personal Injury, Workers Compensation, and Social Security Disability. 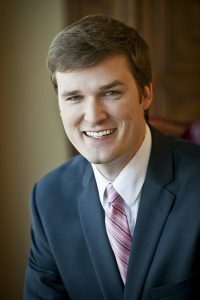 In addition to his civil practice, Evan serves as prosecutor for the Cities of Greer, Mauldin, and Travelers Rest. When away from his practice, Evan enjoys spending time with his family and cheering on the Clemson Tigers. Evan and Allee attend First Baptist Taylors.